As a lover of all things coffee, I’ve developed an odd sort of relationship with the whole single serve trend over the last few years. On the one hand, I love the fact that technology allows me to brew up a convenient cup of Joe in seconds while my eyes are still glued shut with sleep dust. On the other hand, I don’t love the fact that 75% of single-serve brands taste like watered down dirt if you actually take advantage of the “select a size” options on your brewer and try to brew a cup larger than 6 ounces. Who drinks just 6 ounces of coffee at a time? Not this girl! So what’s a coffee fiend to do to get a good cup without sacrificing the convenience of a single-serve brewer? First,start with the RIGHT single serve brewer! The right single serve coffee brewer makes all the difference in brewing a cup of coffee that doesn’t taste like dirt. I’ve had many brewers in my life. I’ve loved many brewers in my life. 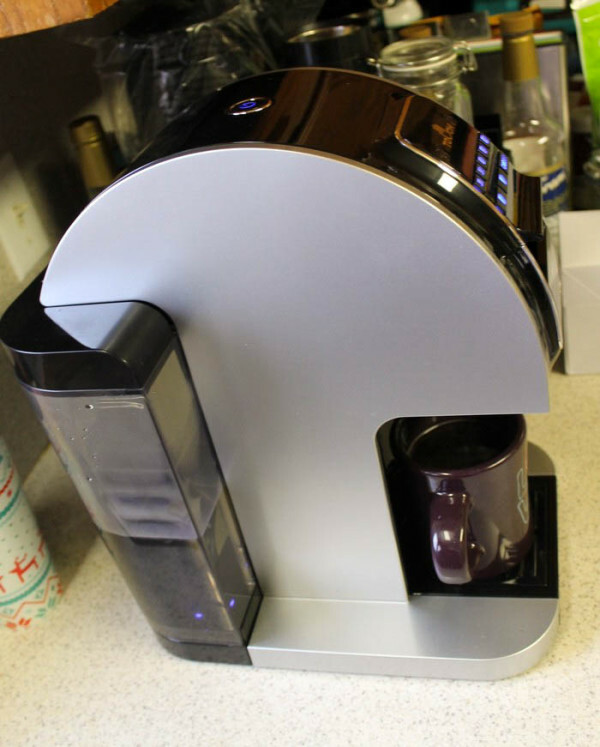 Right now, though, I’m pledging allegiance to my new Touch T526S single-serve system, and not just because they sent me one in exchange for an honest review. Why do I love it so much? Quite simply, because it brews a better cup of coffee. Let me elaborate though, because that would be the world’s shortest review! The Touch T526S system has several features that make it stand out as THE brewer for brewing an amazing cup of coffee. First, it brews at the ideal temperature for a good cup (between 195-205 degrees Fahrenheit, according to the National Coffee Association). This temperature isn’t just an arbitrary “gee, my coffee is nice and hot” temp, it’s the right temp for extracting all the flavor from your grinds. Most other brewers brew at lower temps, meaning that even if the K-Cup manufacturer managed to squeeze in a ton of rich, bold flavor, your brewer is incapable of squeezing it back out. Next, Touch makes sure that all that hot water actually gets to meet up with the coffee in the pod. See, even if you have a brewer that reaches those temps, they often shoot the water through so fast that it barely has a chance to come into contact with the coffee. When you make tea, do you just dunk the tea bag in once and call it a day? No, right? Well, when the water shoots through so fast, it’s basically like doing that to your coffee. The really cool part: even though the brew is a bit slower, the entire process is still faster than every other brewer I’ve ever had because the Touch heats up lightning fast. My coffee is ready in under 30 seconds in the morning. Since Touch heats up only enough water for the amount of coffee you’re making and turns itself off when its done, it’s even more energy-efficient. Touch lets you select 8 different sizes, from 6oz all the way up to a carafe. With the carafe-sized, they give you a Refill Jumbo Cup™ to pack up to 40 grams of your favorite coffee into. Plus it has a nice big 90-ounce tank that wraps around the brewer, so you fill it less often but it still doesn’t take up a ton of space. 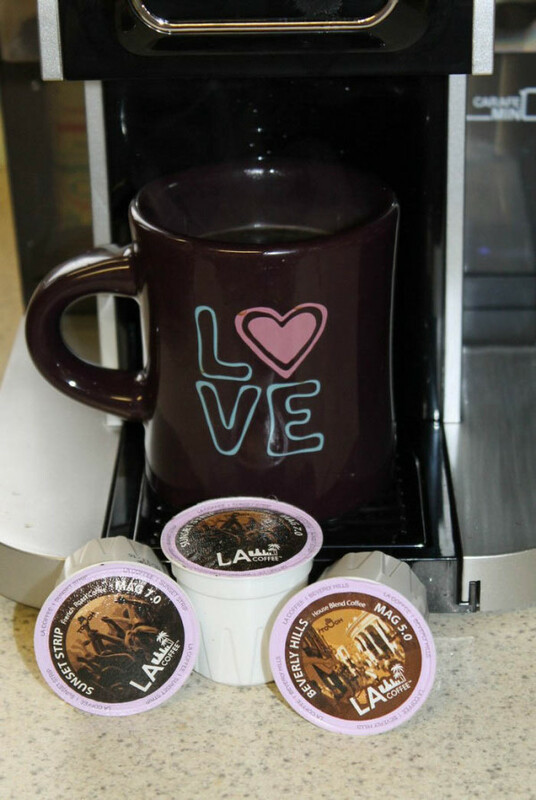 When you buy the Touch brewer, you’ll also receive a selection of LA Coffee single-serve coffee cups. These are insanely awesome. They’re designed to take advantage of all of Touch’s technology and features so you get the perfect cup of coffee every time. LA Coffee comes in a few different strengths, from a light roast to an extra bold (my favorite because it’s extra yummy!). The coffee cups are made using Touch’s re-engineered XBold Cup capsules. They have these fancy little patented Flavor Groove things that work some mad science to make the coffee taste even more delicious. Basically, you can actually brew a large cup without sacrificing flavor. You can buy more online at TouchBrew.com for $15.99 for 24, or a cheaper autoship price of $14.40 for 24. That’s just a little more than I’m usually willing to pay for K-Cups (I try not to spend more than $0.50 a cup), but since I can actually brew a larger cup without losing flavor, it’s actually worth it. The Touch® T526S brewer comes with a reusable Refill Jumbo Cup™ and 26-ounce carafe. is currently available online and has an MSRP of $249.99, but it’s on sale on Amazon for $199.99 right now. Learn more about it by visiting www.TouchBeverages.com. What do you do to really make single serve coffee shine? Do you have a favorite blend? Tell me in the comments! I am a major coffee addict! This sounds awesome and I totally want one. I have always wanted to try coffee makers like this. Thanks for the review, I’ll check this out! This sounds like a great coffee maker. We’d definitely get a lot of use out of one and the fast heating sounds awesome. I put half a cinnamon stick into my cup before brewing. It adds a very nice warmth to the already yummy coffee. Then I add a bit of half and half and a little bit of sugar. I would love this at our house! We are drinking coffee all day long, but we often throw out whole pots that only had one cup used. I’d like to review one of these. I love my Keurig, but it breaks like clock work once a year. I’m ready for something that will last longer. I just started drinking coffee and fell in love with the single serve cups. 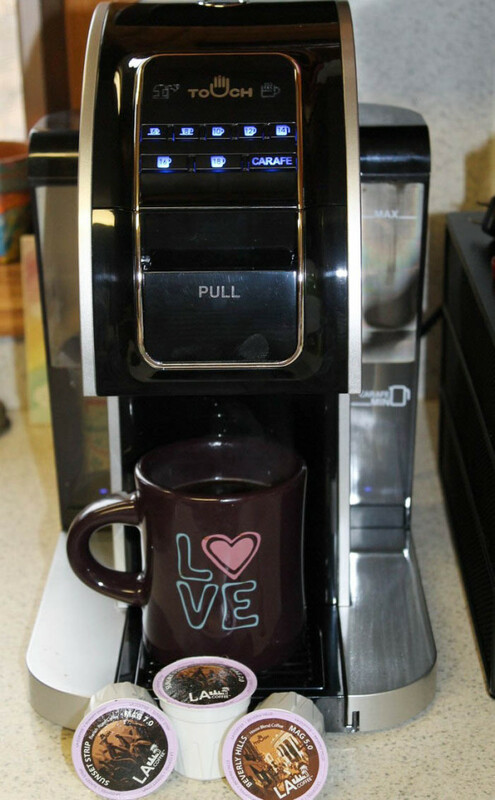 Your coffee maker looks amazing! I love coffee! I need this and can save a little money on Starbucks! my husband loves coffee and always plan to buy one of this for him as a gift but he refused to have one this brand looks verygood! hope to get one someday! Looks like a sturdy piece with size options. We drink a lot of coffee at home, which is the reason why we have not gotten a single serve coffee brewer. I think it is great that you can make different blends for every cup, but I think it would be saving me money to brew a large coffee pot for everyone to enjoy. Just my two cents. Cannot start my day without a cup (or two) of coffee. I haven’t heard of this brand before – thanks for sharing.